Plastics in the lunchbox. Plastics in the sea. While eating lunch at work recently, my co-worker pulled out a sandwich wrapped in a colorful sash of woven materials. This wrapper, probably part of a rice sack from a distant place, was washable and reuseable. And – I thought – perfect. Looking into my own lunchbox, plastics abounded. Sure I washed and reused a few plastic bags made from recycled plastic. But was this enough? It turns out, no. The use of plastics leaves many negative effects in our streams, rivers, and seas. For some time, scientists have known plastics are accumulating in the ocean. A recent study found plastics are floating deeper than previously assumed. Pieces of plastic can extend 20 meters below the sea. One mass near the northwest coast of the United States is about twice the size of Alaska. These particles are ingested by fish, birds, turtles, and other marine wildlife. Often these animals do not survive. Awareness is rising fast and people – myself included – are changing plastic-ey ways. Heal the Bay is working to spread awareness in California, and many creative outreach efforts are happening in Portland. The RiPPLe effect is an annual art gala that showcases creations made of plastics and other trash collected during a river clean-up. This project was started by Jenn Rielly. The International Plastic Quilt Project is promoted by another non-profit to challenge people to live without plastic for one week. Participants collect any plastic encountered and make a quilt piece. The quilt piece becomes part of a traveling exhibit. All of this talk about plastics and water has certainly made me think. While I might not get around to making the quilt piece, I am going to go sans plastics for a week. Let’s give this a go. Are you ready for your daily dose of H20 packaged into a handy-dandy Public Service Announcement? Well, I hope so. Today’s PSA is from WaterAid. It was created to encourage world leaders to make toilets a priority at the upcoming UN Millennium Development Goals (MDG) Summit in September 2010. Musicians playing at Glastonbury Festival were featured in the PSA. Ten years ago, United Nations member states agreed to achieve eight MDGs by 2015 to end global poverty. MDG No. 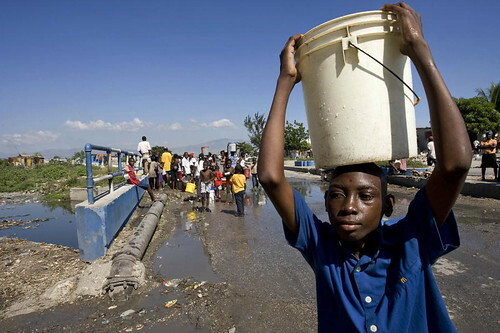 7 includes a target to reduce – BY HALF – the number of people without safe drinking water and basic sanitation. See the recent MDG Report 2010 for more information on the status of all targets. More PSA-maddness can be found covering rainwater harvesting in India, the LA Tap Project, a water-conservation campaign in Denver, the Tap Project 2009, Charity Water, and The World Cup, Water, and Sanitation. A guest blog post originally published on the India Water Portal (IWP) by my friend and colleague Praveena Sridhar. She has given me permission to re-publish her beautiful pictures and insightful post about water leakage in India. As I had been waking up to a leaky tap in my new house for quite some time, I thought it would be interesting to look at the different ways water gets wasted. In this post, I attempt to do a photo blog from my past photo collections on this subject from different parts of the country. This is an image of a leaking pipe from a tanker used by Municipality to provide water in areas with water shortage in Mulbagal, Karnataka. I took this photo during a project visit to the town few weeks ago. This is an image of water leaking from a community stand post, again in Mulbagal. Mulbagal is the town where the pilot project for Integrated Urban Water Management is being planned and implemented by Arghyam in partnership with various organizations. I will write more on this project in the next post. This is an image of water leakage from a municipal bore well. Don’t think, from looking at the operator’s hand, that he has opened the bore. He is actually yet to open it! This is how the pipe is without opening the hose. This photo is again from Mulbagal taken during a water sample collection for water quality testing. Although all the above images are from Mulbagal, it’s not just in Mulbagal such cases of leaks are found from tankers, stand posts or bore wells. It is a scene which one comes across quite often through the country. Kolkata, the city of joy, is a wonderful place. It lets everyone with any economic background live well. The above is a photo from Kolkata where such hoses are found all through the city on the main roads. These hoses are left on for two hours in the morning and evening. The purposes of such hoses are to provide water for the people who live on the roads and slums to clean themselves and to meet their domestic needs. It is very noble thought and well appreciated, but the municipality could have given a knob to open and close these taps. Whoever wants to use the water can use it even when there are knobs. What is the need to let such open hoses go for two hours in the morning and evening go on nonstop? This is a knob of one of the water pipes used to clean the train toilets when the train reaches a particular railway station designated for cleaning. This photo is taken on one such railway station. This is a photo of a steam engine of the toy train which runs between Metupalayam and Ooty. This belongs to Nilgiris Mountain Railways which is one of the oldest railways in India. This engine is not run on coal but is modified to run Diesel. Diesel produces the steam by boiling the water instead of the coal used in the olden days. This toy train has to be refilled with water at one of the stations in-between Metupalayam and Ooty. This is a photograph of one such refill on the Hillgrove station. A ride on this toy train a pleasurable one, it takes you into the past, gives one a feel of the place during the 1940s. But do we really need to waste water for the pleasure? It may be a very easy question for me to ask sitting in front of the computer, writing my thoughts. What really needs to be done to reduce such water leaks? How do we address these water losses? It is not an easy answer. The solution is a mix of technology, awareness generation in community, and creation of monitoring systems to check such leaks in systems by the governments. Note: Next post will be about my visit to Mulbagal and the Integrated Urban Water Management Pilot Project conducted there. Stay tuned to her posts on the IWP by checking this link for updates.